Of all the many sportives I have competed in over the last 20 years, the Marmotte is my favourite. I have ridden it 12 times now and finished 7 times in the top 20, so I know it quite well. Before describing the course and giving you a few “insider tips”, here is a brief history of the event. The Marmotte is not only the best known but also the oldest of the French sportives. The first edition was way back in 1982. Because of its difficulty, the iconic reputation of the climbs, and the prestigious finish in Alpe d’Huez, the number of riders increased rapidly and was soon in the thousands, but for the first 20 years it was still possible to register on the morning of the race itself. The popularity of the Marmotte increased dramatically during the first decade of this century, with the result that the 7500 places are now sold out within a few hours. The peloton has become very international and cyclists come from all over the world to participate in the most mythical of all the sportives. The original route went over the col de la Croix de Fer. Ten years ago road-works forced the organisers to use the nearby col du Glandon instead. In this new version, the total distance is almost the same at 175km, but the total climbing at 4,900m is 150m less. The course is thus about ten minutes faster. Overall the change makes very little difference, except that the descent from the Glandon is more dangerous than the one from the Croix de Fer and is therefore neutralised. 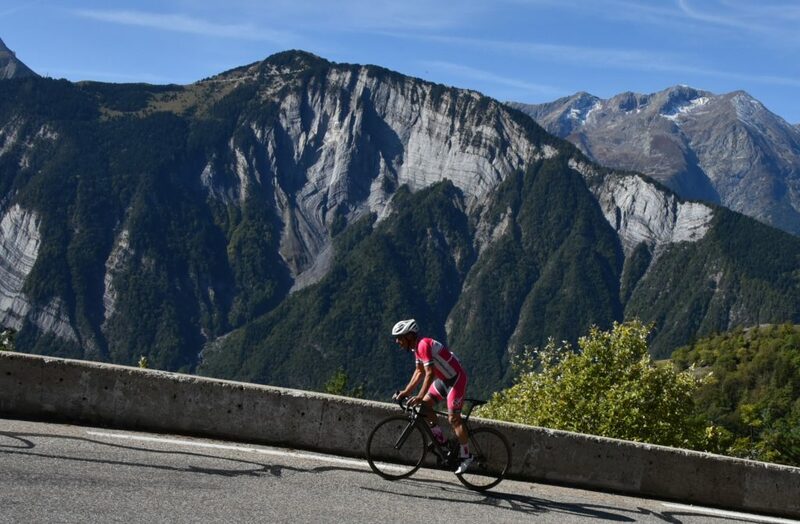 The best riders can expect to take around 6h15 to 6h30, including about 30 minutes for the neutralised descent from the Glandon. The “Lanterne Rouge” or last person to finish usually takes about 14 hours: a very long day on the bike! The complete circuit consists of several distinct sections, including two valleys and four cols. Starting from Bourg d’Oisans, the first 10km are flat. The pace here is extremely high: you would never think that the riders are heading out for such a long day. It feels more like an out-and-out road race, with the leaders riding at more than 50km/h. The reasons are probably the high level of excitement, the desire to be at the front and the generally very high level of the participants. Depending on your objectives for the day, you will have to choose either to match the initial pace or to settle straight into your own rhythm and let the leaders get away. You will encounter the first climb well before the foot of the col du Glandon. The rise to the dam at the Barrage de Grand Maison is less than 1km at around 5%, but it can be tough to manage the transition from the very high pace on the flat to the small chain ring. After this short rise three more kilometres of almost flat road bring you to the foot of the Glandon. The groups that split apart on the first rise often reform on this section, but beware of expending too much energy in doing so. There is still a very long way to go to Alpe d’Huez. The same thing happens every year. Each group attacks the initial slopes of the Glandon at a pace that is far too high to sustain to the summit, let alone all the way to the finish. The single most important piece of advice for riding the Marmotte is this: from the start of the Glandon onwards, set your own pace at your own rhythm and ignore anyone that overtakes you. You will achieve your best time by keeping a constant level of intensity on all the climbs, which, need I remind you, add up to a total of 65km at more than 6%. 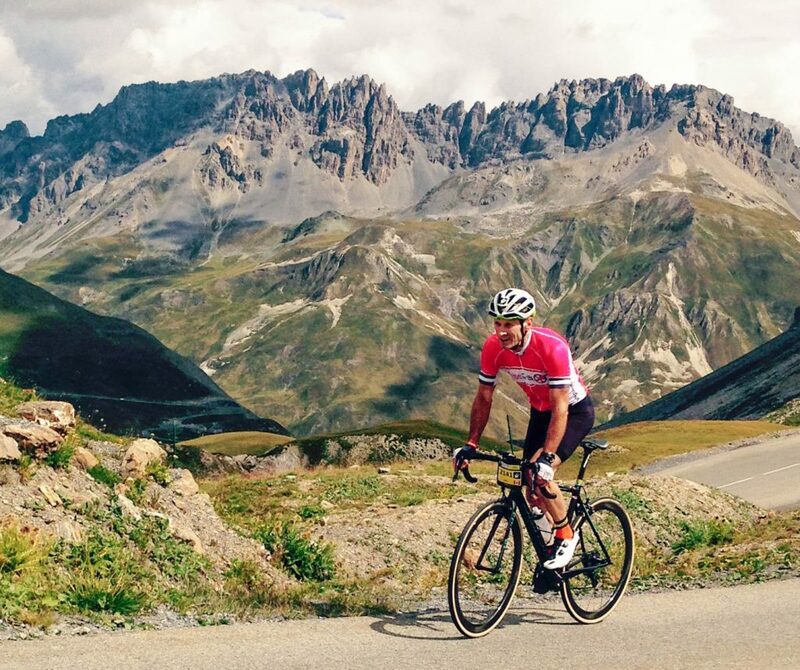 If you start too fast, you will struggle on the Galibier and may even find the final climb to Alpe d’Huez insurmountable. If you have a power meter, stick to your target power output and don’t be tempted to push 10W or 20W harder. If not, watch your heart rate to stay in the correct zone or rely on your sensations: you should be able to talk easily enough in short sentences. If you can’t speak, you are going too hard. If you judge your pace correctly, you will start to overtake other cyclists after about 6km of steep climbing, at the small village of Rivier d’Allemond. The remainder of the climb to the col is easier. The slope is around 6% and several flatter sections are good for recovery. At this point however you will have been climbing for over 20km and possibly regretting having started too fast: most of the work is still to come! Once at the summit and over the timing mat, take the time to eat and drink as well as to put on a windproof jacket. The descent is untimed so no need to hurry; however it is best not to lose too much time because you don’t want to stiffen up or to lose touch with a good group to ride with in the valley. The first part of the descent is difficult and dangerous: stay concentrated! Timing restarts in Saint Etienne de Cuines, immediately after the right turn at the bottom of the descent. Don’t cross the timing mat on your own! Wait for a group to form and go together. From here, you have about 20km of false flat to ride up the Maurienne valley, with an altitude gain of just 150m. The essential rule here is to ride in a group and not to waste energy on your own. You need to use this stretch to complete your recovery from the Glandon and prepare for the long haul to the top of the Galibier. If you do find yourself alone, either ride hard for one or two minutes to catch up the group in front or slow right down and wait for the next group to catch you up from behind. Only choose the first option if the gap is less than 50m or so and you can close it without going in the red. The col du Télégraphe is the second significant climb of the day. It is quite long at 11.5km but the slope is fairly regular at about 7%, except for the first two kilometres that are a little steeper and the last two that are flatter. The road winds up through a forest. It is well shaded and thankfully cool on a hot day. Keep a steady pace, always at the same relatively low intensity. After crossing the summit, you will descend only 5km before reaching the foot of the next climb, to the col du Galibier. The descent will thus take you barely five minutes. Don’t forget to eat and drink, because you are about to face the biggest climb of the day, one of the most iconic climbs in the world, a real giant. The slope is never extremely steep, with the exception of the final kilometre at 11%. 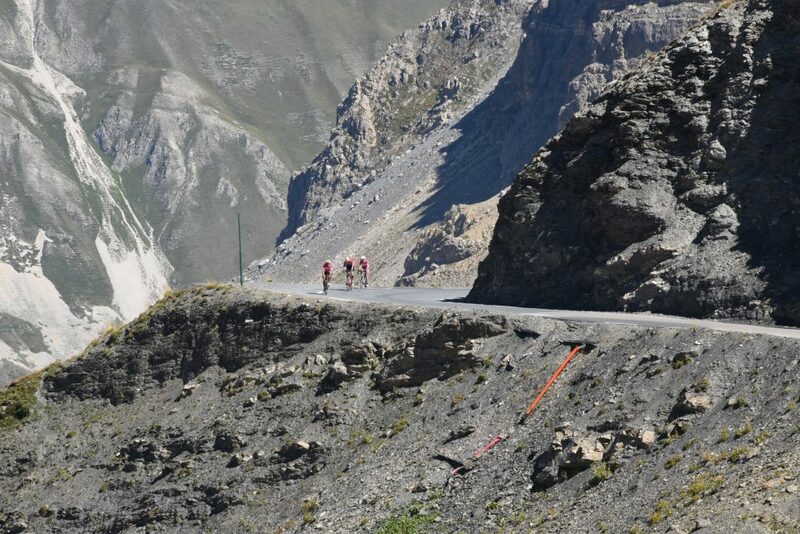 What makes the Galibier one of the hardest climbs in the Alps is the length, the altitude and the fact that it immediately follows on from the Télégraphe. The first challenge comes quickly, before leaving the village of Valloire, with a steep ramp to climb in a straight line before Les Verneys. This is a tough section mentally, because the climb is steeper than it looks. 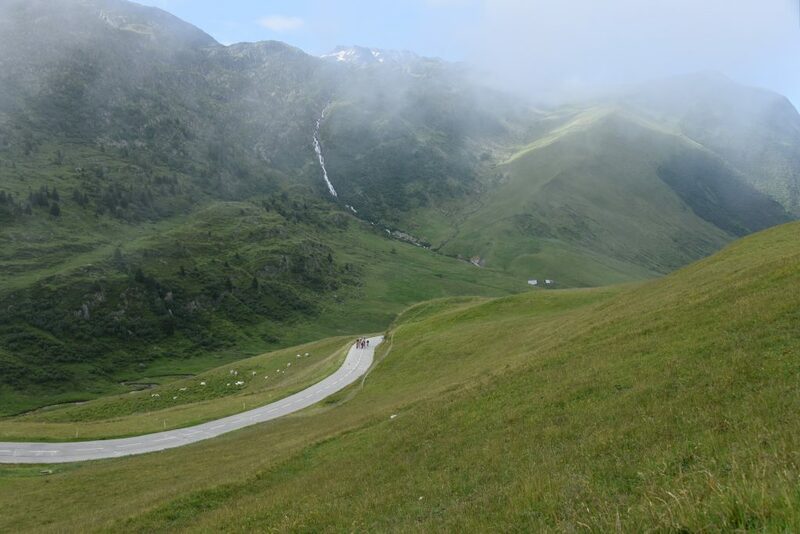 The road then eases off, varying between 3% and 6% all the way up to the head of the valley at Plan Lachat, reached after 10km and at the altitude of 2000m. With a bit of luck, there is a tail wind during this section. The Galibier really begins at Plan Lachat. The road cuts back across the valley, over the bridge and then climbs steeply through a series of hairpins at an average of 8% for the last 8km. You will start to feel the lack of oxygen as you climb well above 2000m. The final kilometre is particularly tough at 11%: keep some energy in reserve! At the summit, grab something to eat and drink, fill your pockets, put on a jacket and begin the descent without delay. The first 8km of descent are very fast. The road is fairly wide and the slope varies around -8% until the col du Lautaret. This is the second point at which you must join a group. Ideally, you should ride with them for the next 40km, until Bourg d’Oisans and the foot of the final climb. Most of this is a gentle descent on which you need to pedal continuously to maintain a good pace. There is often a headwind. Beware of several dark tunnels and a couple of unexpected climbs that can cause cramps if you take them too hard. Take your share of relays, but make sure you pedal at a cadence that enables you to recover as much as possible, and keep eating and drinking. There is one last challenge to come. After more than 160km and three major climbs, here you are at the foot of the last effort of the day. It’s not all over yet. You have somewhere between 50 and 90 minutes of hard climbing to go. Not much after all those hard months of intense training! 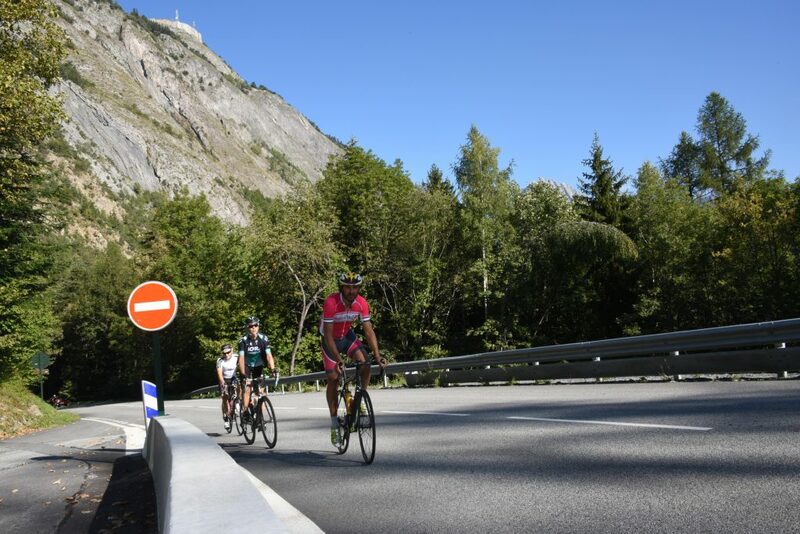 During the climb, it may help to mentally check off the landmarks: the village of la Garde, after the difficult first three kilometres, then the village of Huez after 8 kilometres. Until la Garde the gradient is hard: often around 12% on the ramps, but luckily the hairpin bends are flat (which explains why the average gradients quoted for these first kilometres are relatively low at 10.4%, 10.2% and 8.1%). Climb this early part at an easy pace, and wait for the exit of the village to increase the tempo. From this point on, the energy you saved at the cost of a few seconds on the Glandon will pay back in minutes. If you have managed your effort just right, you will be able to accelerate progressively to finish at the highest intensity of the day, overtaking dozens of other riders in the last few kilometres! Olivier has competed in the Marmotte twelve times and finished seven times in the Top 20. His best result was 7th. He is a fully-qualified cycling coach and loves sharing his experience during Alpine Cols coaching camps. Want to perform at your best during the Marmotte? Join one of the Alpine Cols coaching camps, improve your skills and learn race tactics from our expert coaches. SPECIAL BONUS: Benefit from a 3-month free trial of a set of InfoCranks®, the best power meter currently available (preferred by the UCI development centre and British Cycling). If you would like a professional coach to help you prepare for this (or any other road cycling event), contact us. We will tell you immediately if we can help or not.